The Young Members Group (YMG) supports recent structural engineering graduates with their transition between school and career, as well as local young Engineers in Training (EITs) and newly-licensed Professional Engineers (PEs) who currently practice structural engineering or are interested in learning more about the structural industry. SEAMASS YMG provides a platform for young engineers to exchange and share technical information, to network in a community environment, to enhance structural knowledge through design seminars and construction site-visits, and to develop leadership and management skills by being part of the YMG team. The YMG can provide mutual benefits for local firms as well as young engineers, so company leaders are asked to encourage their firms' young engineers to become actively involved. If you know anyone who is working in another civil discipline but is still interested in the structural industry, please let them know about the Young Members Group. Please visit the Meetings & Events Calendar for complete details and registration information for all upcoming SEAMASS events, including YMG meetings and programs. SEAMASS YMG members & guests enjoyed an evening of camaraderie, and earned first place against YMG groups from across the country! The SEAMASS YMG tested their knowledge against local trivia enthusiasts as part of the Holiday Trivia Night sponsored by DeWalt. With Members and Guests mixing and mingling with fellow engineers from across the state, this trivia night tested the YMG on a variety of subjects from science to pop culture. 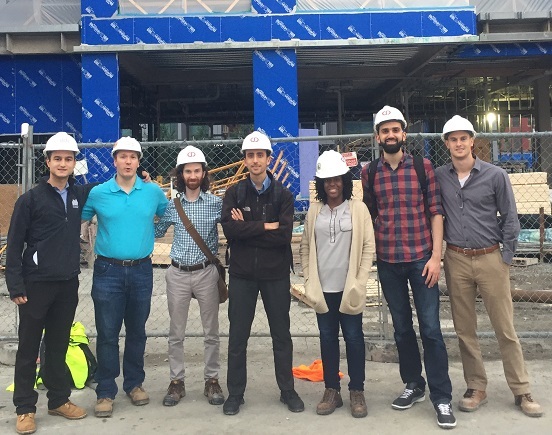 McNamara Salvia Senior Project Manager Jonathan Beyreuther, PE and Design Engineer Jonathan Malmut, EIT led the SEAMASS YMG on an in-depth site visit of 40 Water St., the ambitious office building revitalization project located in Boston's Financial District. Topics discussed included the challenge of designing and constructing a new 8 stories atop a preexisting 9 story building, the implementation of concurrent support systems (new concrete cores, super columns, and custom built plate girders), and the rehabilitation of aging structural elements. 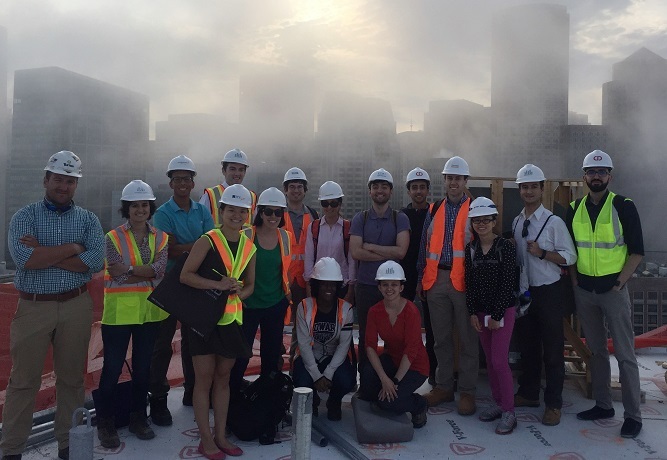 McNamara Salvia Senior Associate Brendan O'Rourke, PE and Design Engineer Robert Kane, EIT led the SEAMASS YMG on an exciting tour of Sienna Inkblock V, the exciting 10 story, steel framed luxury condo building constructed in Boston's South End. The SEAMASS YMG competed against young member groups from across the country in the annual NCSEA YMG Trivia Night, testing our knowledge of a variety of topics including engineering history, technology, and design codes. McNamara Salvia Senior Project Manager Ellen Taylor, PE and John Moriarty + Associates Superintendent Joel Dyson led the SEAMASS YMG on an exciting tour of one of Boston's most active construction sites, Seaport Parcel C, featuring over 10,000 tons of steel and 13,000 cubic yards of concrete. 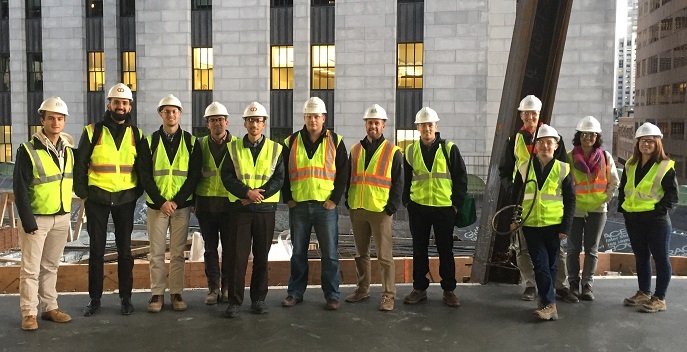 Suffolk Construction led an informative seminar and site visit of Millennium Tower, Boston's new 60 story, 684 foot tall skyscraper located in the heart of the Downtown Crossing District. On February 26, in celebration of Engineers Week-New England, Northeastern University, SEAMASS and BASE jointly hosted Ben Schafer, Ph.D., PE and Chair of the Department of Civil Engineering at John Hopkins University, who presented Birth of the Steel Skyscraper. Dr. Schafer shared his presentation via video-conference with an audience of Civil Engineering students and professors as well as practicing structural engineers. Preceding Ben's lecture, Michael Fillion, PE, SECB made a short presentation on snow loads and their effects on buildings in the winter of 2015. This gave students an idea of what some practicing structural engineers have been up to this winter. This is the second year that this group has sponsored the Distinguished Pre sentation at NU. In an effort to unite students with practicing engineers, it is anticipated to become an annual event. SEAMASS thanks Jerry Hajjar, Ph.D., P.E., Chair, Dept. of Civil Engineering at NEU for helping to facilitate the event, as well as Bassem Almuti, SE who chaired a committee of young members and students to coordinate with Jerry and Northeastern University. The SEAMASS Young Members Group (YMG) hosted a free seminar titled Intro to the 16-hour SE Exam. Presenters included Peder Hals, EIT; Bassem Almuti, EIT; and Scott Rabold, EIT. It covered the application, registration, and studying process for the SE exam, followed by a discussion of frequently asked questions. Open to all SEAMASS members and non-members, the event was held at Cannon Design in Boston. The SEAMASS Young Members Group (YMG) hosted an after-hours social event on June 5 in the lounge at Avenue One restaurant in Boston. Event organizers were pleased that despite an overcast sky and intermittent rain, several young engineers stopped by after work to mingle and network among their peers. The new building at 525 Huntington Avenue in Boston, MA has a 13,670 square feet footprint steel frame structure, being constructed to provide housing for Wentworth students with 305 beds in apartment style units on 7 floors. 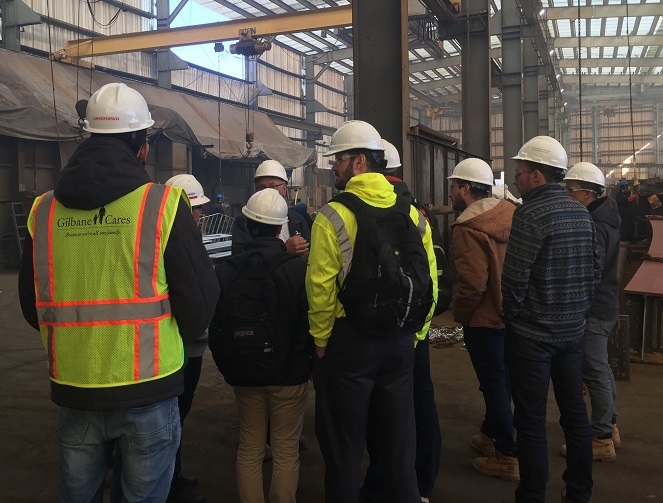 The tour consisted of a short presentation by personnel from Wentworth University and Bond Brothers, followed by a tour of the new building. Tour leaders and officials explained some of the challenges encountered related to construction in close vicinity to existing buildings and underground utilities, as well as the construction process and sequencing. In February, the SEAMASS YMG organized a Financial Planning Seminar to provide participants with tips and techniques for financially transitioning from education to career.